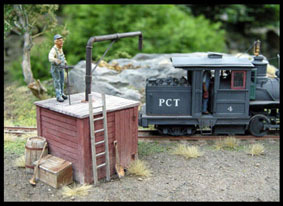 This distinctive 1/4" scale structure is just the thing for that woods line or industrial site.With a foot print of 1.75 " X 1.75" it can fit almost anywhere.The walls of the building are mitered cast resin while the plumbing is white metal, brass or aluminum. 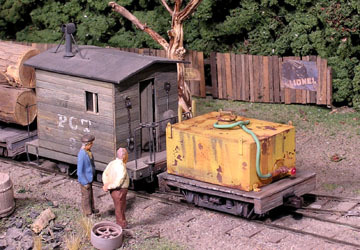 THE SHED This little shed can be used as a handcar shed, storage shed, sand house shed or a multitude of other applications. It has textured walls of cast high density plaster and a cardboard roof .The foot print for this structure is 2 1/4" by 3 1/4". THE SHED / CHICKEN COOP Now with new details. 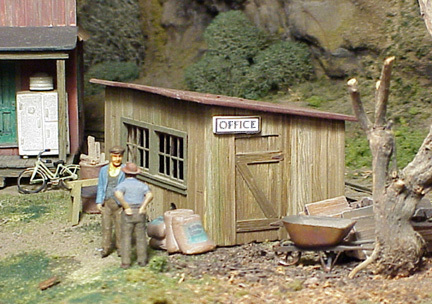 This building is modeled after an old chicken coop in my yard that was converted to a tool shed then a playhouse. 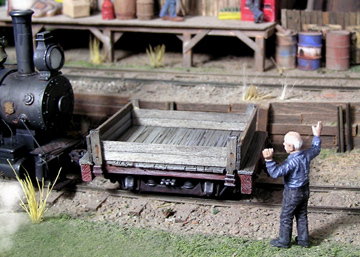 On my railroad the model serves as a yard office. 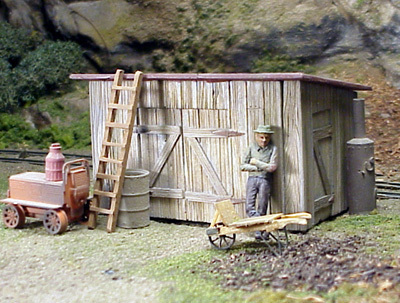 This high density plaster kit with a footprint of 2 1/4" by 4 1/4"
includes Grant windows, cardboard roof, cast grain sacks, a cast wooden barrel, a cast wooden crate and some tools. 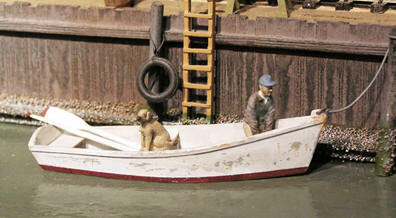 16FT.Rowing Skiff This handy little boat would be right at home on a log pond, lake or river. 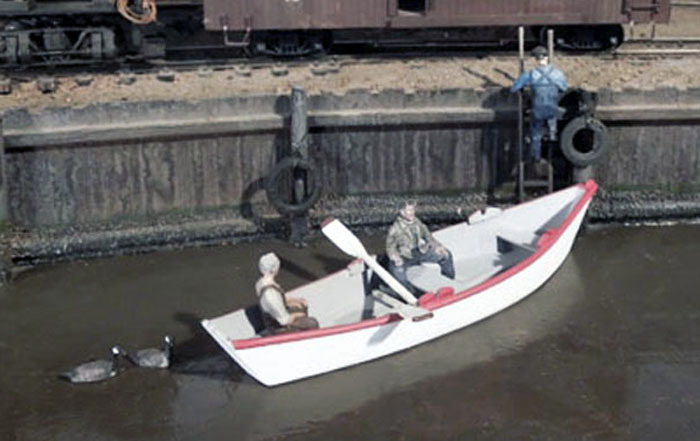 Our kit is cast in resin and comes with cast pewter oars. The seats are styrene and the rowlocks are cast resin. FISHING DORY These were popular fishing boats on both east and west coasts of N.A. Since they were stackable they were hauled to sea on schooners and used for cod and other fisheries. 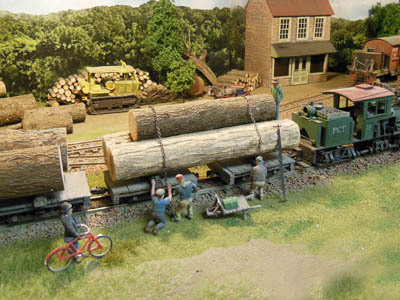 In later years they were adapted for outboard motors. The notched transom made them good for sculling. This kit includes a pair of pewter oars, a line bucket and cast rowlocks. 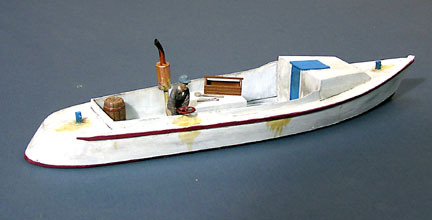 This workboat has a resin cast hull ,cabin, engine box and sorting table with other parts of metal and styrene. She will add a real touch of "down home"to any water front scene. 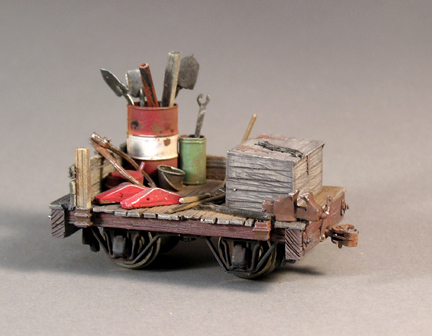 The kit includesa barrel, tool box and a few tools for detailing your scene.Footprint 2" X 9".